Here is a great idea for those who like to make things. The large wooden fly box can hold around 300 lures. Although I carry several small fly boxes in my vest pockets when trout fishing, I also wanted several large fly boxes to store a large range of flies and lures in my vehicle, should I wish to fish them while travelling around the country. Previously I carried them in large plastic compartment boxes designed to carry hard-bodied lures. Each compartment would hold several dozen lures but they tended to get all tangled together. 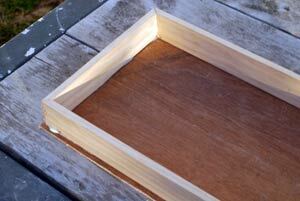 Just a length of 40mm x 10mm dressed pine and thin plywood is all the materials you need to make the large fly box. I travel around to different places for extended periods and like to have a go at several different styles of fishing. In other words, I needed to carry a lot of different flies with me. After all, they are no use if they are at home. Being a fly tier means I can easily produce heaps of feathered lures and nymphs very cheaply. I do a bit of sea-run trout fishing using large lures when the water is discoloured. I’ll often switch over to dark coloured lures as darkness draws in. On the other hand, if the rivers are low and clear something like a sparsely tied size 6 or 8 Grey Ghost is more likely to get a strike. When the river is running a bit high and discoloured anglers fishing Canterbury river mouths will use larger yellow coloured lures like the Yellow-Lady. Personally, I like to use rabbit skin for my wing material whenever possible rather than the more traditional hackle feathers. Rabbit skin is much quicker and easier to tie, and if you can get your own skins, way cheaper as well. 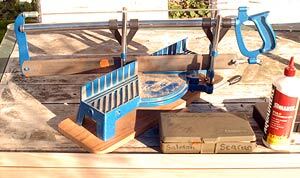 A mitre saw makes cutting the side of your fly-box frame quick and easy. I’ve gone for a fly-box measuring 380mm x 200mm x 40mm closed. This will easily hold 300 of the largest lures. I figured that if I made it any larger if would become awkward to carry in a pack, if I need to do so, as well as difficult to stash in a vehicle. The best idea would be to make several of this size rather than something so big it would be a pain to carry anywhere. Now 300 lures are quite a lot. A box this size would also probably hold 600 nymphs. They would have cost a thousand dollars to buy in a shop. Therein lies the great advantage of tying your own. This lot, including the box, would have cost around a tenth of that amount. The box was very easy to make from materials I found in the shed. Just a length of dressed pine 40x 10mm and a bit of thin plywood was all that was needed for the box. I glued it together with PVA glue and nailed it as well. 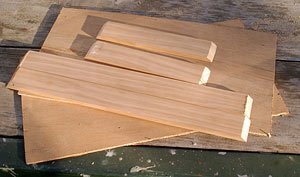 For more of a fine arts-and-crafts finish, it would be better to glue and clamp it only. After the glue was dry I cut all the way around the frame to separate the two halves. Just a bit of filling and sanding was all that was required for finishing. You can tape the corners and clamp the top and bottom in place after glueing for a very professional finish to your fly-box. I varnished the book to make it protect it from damp and improve its appearance. I lined the inside of each half of the box with closed cell foam from an old camping bed mat glued in place with Ados F2 contact adhesive. This worked very well. I guess it will eventually wear out from having too many hooks pushed in and pulled out of it. But even if it does it will be very quick and cheap to replace. I have the brass hinges and catch to keep it closed but these weren’t attached at the time the photographs were taken. You could easily substitute a suitable tin or box instead of making your own. Just cut out and glue in closed cell foam to suit. I’ve got another couple of these little projects in mind so stay tuned. The large wooden fly-box can hold around 300 lures. 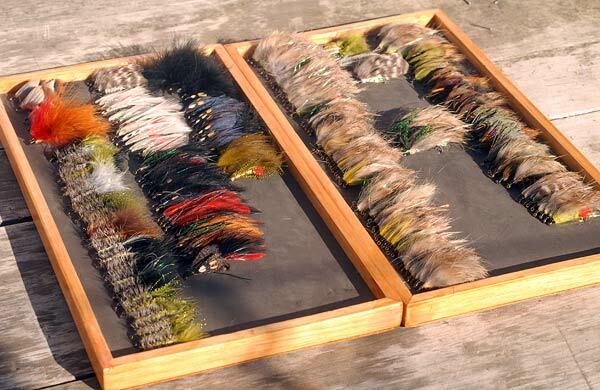 The finished fly-box can easily hold 300 larger size trout flies. The finished box with brass hinges and Velcro fasteners. The Command brand fasteners keep the box closed yet allow it to be open quickly and easily.